As I mentioned in my New Year post things got very soggy in Melbourne in the run up to the end of 2009. 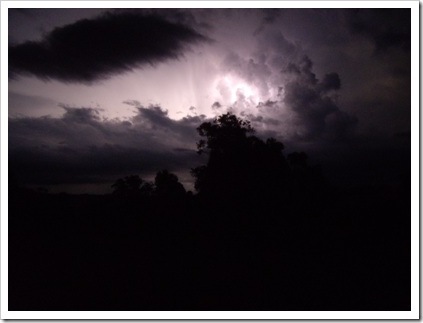 We were treated to another light show the following night. I then discovered just how hard it is to photograph lightning, especially when you forget the tripod! The only saving grace was that we were at the farm, and there was plenty of open space. Even so, I still had some silhouetted trees for a little foreground interest but they are better than rooftops.